Located along the Burlington Northern-Santa Fe (BNSF) Railroad and Old US 66, midway between Barstow and Needles, 7.5 miles west of Amboy, and 21.5 miles southeast of Ludlow, 0.5 miles west of the major dirt road that heads north from Old US 66 to the Lava Hills. In 1883 the Southern Pacific laid the tracks through the Mojave Desert between Needles and what is now Barstow. This station was named after Bagdad, Iraq due to the inhospitable climate in both places, but the "H" was dropped form the name. Some sources erroneously claim the name came from the Bagdad Mining & Milling Co., which WAS named after that mid-eastern city. The station was established before the mining company was established however. In 1889 the post office was established. Bagdad was a major station that supplied coal, fuel oil, and water to westbound trains that had to work to climb the Ash Hill Grade to the northwest. Water was brought in with 10,000-gallon tank cars from Newberry Springs in daily 20-car trains. It also served as a shipping point for gold mines in the area during the 1900-1910 boom. Two of the major mines served by the station included the Orange Blossom Mine, and the War Eagle. According to the book Dictionary of California Land Names, a 200-ton capacity ore mill operated here in 1903. I've been unable to confirm or deny that fact, but from all indications, the mill was probably located at a small mining camp near the Orange Blossom Mine. Bagdad grew into a bustling small railroad town complete with a company commissary, depot with telegraph office, dining hall, hotels, library, post office, restaurant (Harvey House), saloons, school and stores. In the 1900-1910 era when the Orange Blossom Mine boomed, the mine promoters tried to build up the town even more, but failed. During this period, five bored railroad employees wanted to create a little fun and excitement for a passing passenger train, scheduled later in the day. They gathered a huge amount of dry brush, and dragged it into the center of Amboy Crater, a small volcanic cone several miles to the southeast. As the train was about to arrive in Bagdad, they fired the brush, and a huge column of flames and black smoke boiled into the sky above the crater. The startled tourists thought they were witnessing a volcanic eruption! In 1918 a major fire destroyed most of the wooden buildings in the town. Very few escaped the fire, and those that did weren't used as much, as the town was dying. The railroad had re-engineered the Ash Hill grade and improved the trackage so there was less need for the extra crews and equipment to be stationed at Bagdad. In 1923 the post office closed, and in 1937 the library shut down. According to the WPA Guide to California-1939 edition, the small town's overnight accommodations and population of 20 was "...merely a shell of the rip-roaring camp that thrived here when the War Eagle and Orange Blossom mines to the north (Bristol Mtns) were active." In that book, mention is made of a few buildings and the remains of a huge oil tank with its sides blown in by the relentless wind. During the 1940s and 1950s a few homes, guest cabins, gas station and Alice Lawrence's very popular Bagdad Café lined the north side of US 66 serving travelers along the bustling highway, and marked the shriveled remains of the once bustling railroad town. The cafe was the only spot in the region to have a jukebox and dance floor, and was a popular stopping place. By the 1960s it was dead, and by the 1970s all that remained was rubble and a few concrete slabs. In 1973, when I-40 was completed to the north, the old site was forgotten. All that remains is an unmanned, official US Weather Bureau meteorological station. Bagdad also holds a dubious record...the longest dry spell in American history. Bagdad is the spot where from October 3, 1912 to November 8, 1914, not a single drop of rain fell for a period of 767 days! It is considered the driest spot in the nation, with an annual average of only 2.3 inches. It also is said that four out of every 20 years is dry, without any measurable rain! The 1985 movie Bagdad Cafe, by German film producer Percy Aldon was loosely based on the town. 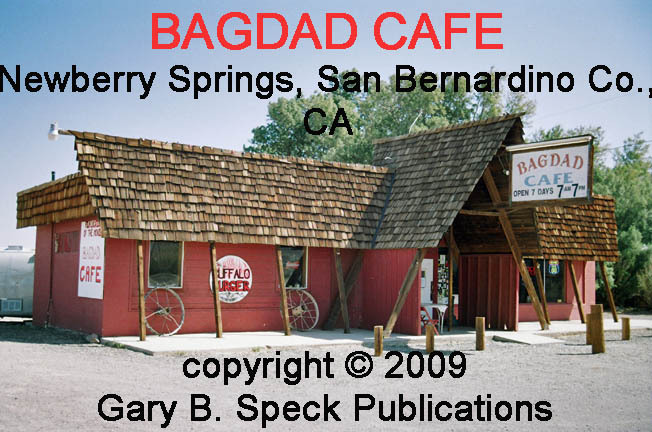 The Bagdad Café featured in the movie is actually located in nearby Newberry Springs, also a faded old class D road town in its own right. Note from Gary – Thanks Bill. Any memories you’d like to share??? This was our GHOST TOWN OF THE MONTH for September 1999.